The State of Texas requires that a minimum of 1 PDH per renewal period must be in the area of professional ethics, roles and responsibilities of professional engineering, or review of the Texas Engineering Practice Act and Board Rules. This course satisfies this requirement. The Texas Laws and Rules course by pdhlibrary.com is designed to be an interactive correspondence course. 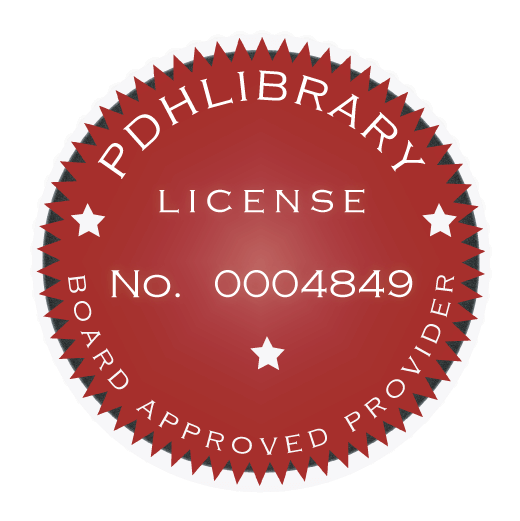 The students of this course are encouraged to contact pdhlibrary.com to discuss the practice questions as well as to discuss other questions that may arise while taking this course. All inquiries will be answered in within two days or less. The primary objective of this course is to familiarize the student with the laws and rules regulating the practice of engineering in the State of Texas. Upon successful completion of the course, the student will be well versed in all pertaining laws and rules governing the engineering profession. The "Texas Engineering Practice Act And Rules Concerning The Practice Of Engineering and Professional Engineering Licensure" is included with this course. This course will NOT satisfy the Florida Board Laws and Rules course requirement. This course will be effective for the year 2017 after which it will be updated with a new course number and can be taken again. - To complete the course you must pass a short 10 question multiple-choice/ true-false quiz.